Broadway Has a New "Golden Boy"
Seth Numrich as Joe Bonaparte and Danny Burstein as trainer Tokio in LCT's "Golden Boy"
Talk about theater that packs a punch. Broadway is gearing up for the opening next week of the Clifford Odets classic “Golden Boy” at the Belasco Theatre, in a production presented by Lincoln Center Theater. 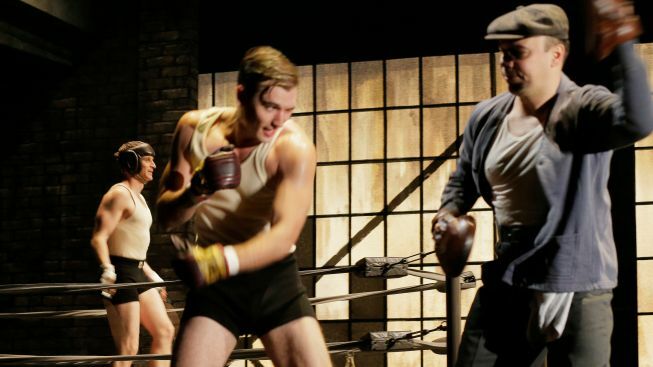 “Golden Boy” is the story of Joe Bonaparte (Seth Numrich, of LCT’s “War Horse”), a gifted violinist who sees his future not in a concert halls, but a boxing ring, where he intends to earn big money as a prize-fighter. The Belasco is the same theater where “Golden Boy” had its acclaimed debut 75 years ago; the 1939 film was William Holden's breakthrough role. This is a rare Broadway production for the Odets classic, and it’s the second Odets work to be presented by LCT following the Tony Award-winning revival of “Awake and Sing!,” also directed by Bartlett Sher, in 2006. The cast of 19 includes Emmy winner Tony Shalhoub as Joe’s father, three-time Tony nominee Danny Burstein (“South Pacific”) as Joe’s trainer and Australian screen actress Yvonne Strahovski (TV’s “Dexter”) as love interest Lorna Moon. On Nov. 29, Lincoln Center will host a free chat open to the public with director Sher and Walt Odets, the author’s son. The event takes place at 6 p.m. in the lobby of the Beaumont Theater at Lincoln Center. Broadway.com has some fascinating background on the drama here. Below, one of LCT’s promos for the production, which is now in previews.